This ‘Nins’ wooden playset is Bram’s favourite toy! The size of the little wooden peg dolls are perfect for his little baby hands. 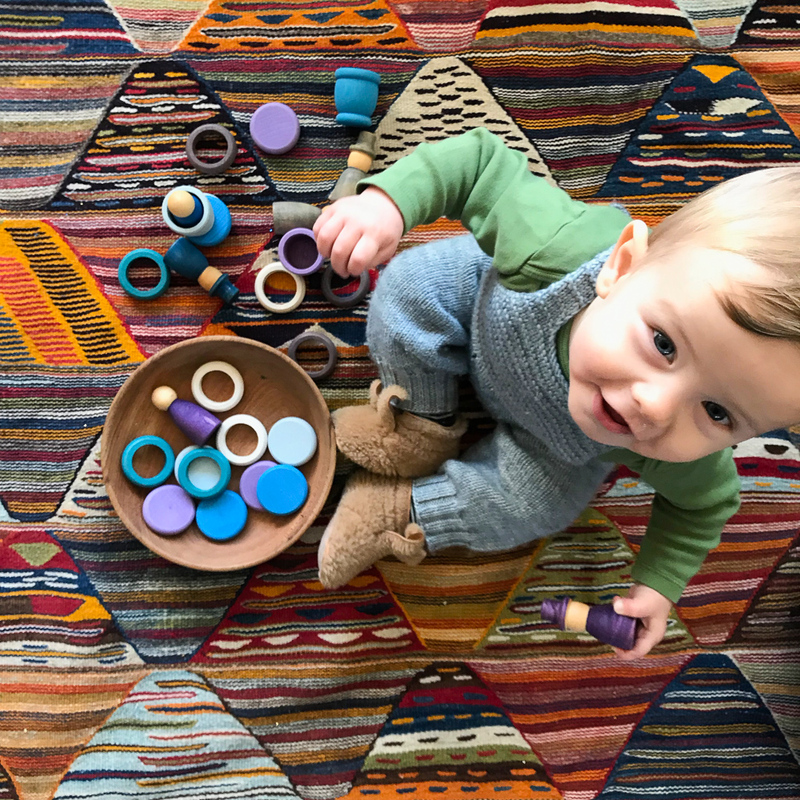 He loves to carry them around with him when he’s crawling and cruising around; often one in every hand. Officially these wooden peg dolls are part of a season play set (ours features the winter colours). They can be used as a sort of Waldorf calendar, following the cycle of the seasons. 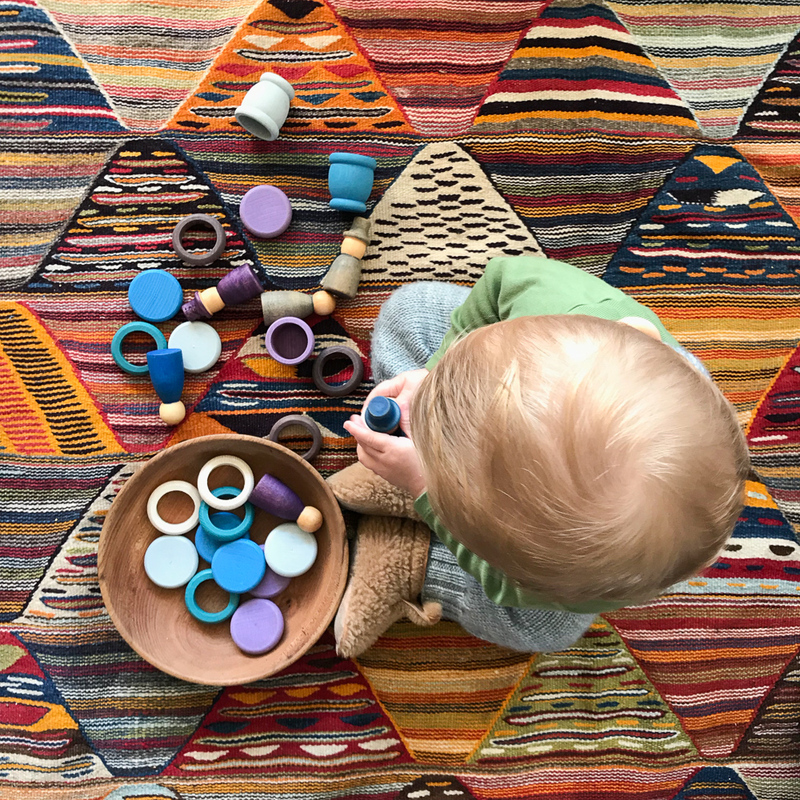 We don’t use it that way, but the cups and coins and rings, which come with the dolls, are interesting shapes to discover and can be used to stack and nest the dolls. The dolls also appear in other type of play in our house. They often are the ‘people’ when Ava and Casper are making up stories and they create little houses for them to live in and little beds to sleep in. I love how pretty and simple these toys are, and how they can be used as open ended toys for a long time. I’m going to keep them in mind as a new baby or first birthday gift, as they are a lovely toy to have in any family household! Love this – I’m ordering now for a baby gift. Thanks, Esther! Also, my family is moving to London and I’m wondering if you have a list of your personal favorite places somewhere? I didn’t see anything on the Babyccino guide from you. I love when toys are both pretty and open ended enough to age with the small people. Our wooden Grimm’s stacking cups have been like that. My two are 7 and 4 now and they still use them as play dishes or mixed in with other wooden building blocks.